BEATTY — The General Tire Vegas to Reno Race organized by Best in the Desert started in Beatty, went through Tonopah and finished in Dayton close to Reno. 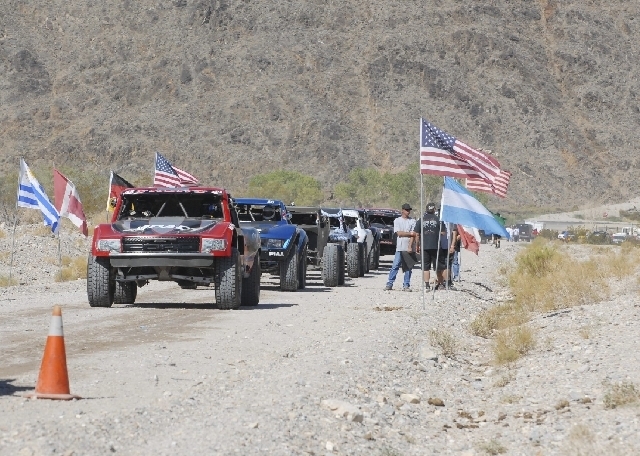 The 550-mile race is billed as the longest off-road race in America and is organized by Casey Folks who heads Best in the Desert. Racers came from Argentina, Australia, Brazil, Canada, France, Germany, Ireland, Mexico, South Africa, Uruguay and 25 U.S. states to participate in Vegas to Reno. According to Best in the Desert spokesperson Russ Turner, there were no fatalities in last weekend’s event. Turner said it was a smooth race from start to finish. One hundred seventy-four racers finished the race out of the 275 racers that started. This year’s overall winner was Jason Voss of Cupertino, Calif., and his team members Rich Voss, Cupertino, James East of San Jose, Calif. and Robert Mills of Wheatland, Calif.
Their finish time was 9:13:10. The Voss team drives in the Trick- Truck Class or 1400 class. This was the second race Voss has won in the series for the year. Earlier in the year his team won the “Parker 425” Best in the Desert Race. Finishing in second was Jesse Jones of Phoenix, Ariz. His team is composed of Willie Valdez Jr. of Menifee, Calif. and Joe Weining of Tucson, Ariz. They were also in the Trick-Truck Class. Jones’ time was 9:19:56. Voss finished physically behind Jones, but won on corrected time since Jones started out in front of Voss. The racers in the Trick-Truck Class were competing for $132,000 in bonus cash. Jason Voss had won up to $16,000 coming into the Vegas to Reno race. He is also getting bonus money from Ford and a purse from the race based on the number of cars in his class. His bonus cash and purse amount had not been calculated at press time. In the motorcycle and quads, there were just six seconds between first- and second-place teams. Nick Burson of Ridgecrest, Calif. and his teammate Justin Morrow of Pinon, Calif. took first with a time of 9:01:58. David Pearson of Panaca, and his teammate Robby Bell of Menifee, Calif. took second with a time of 9:02:04. Best in the Desert has six races in the season. There are two more races left. One in Parker, Ariz. called the “Bluewater Desert Challenge” on Oct. 11-13. The last race of the series will be the “Henderson 250” in Henderson Dec. 6-8. Turner said it’s not unusual for racers to take one or two races during the year. Voss has a chance to take four. “It is rare to win three,” Turner said. “There have been times where guys have won three in the car/truck classes but it has been a while. If Voss won the next one, which is a different format, that would be an accomplishment,” Turner said. “Robby Gordon almost won three in a row. He won Parker, won the Mint and won second at Silver State. In the motorcycle class this is done all the time, but it has been a while in the car-truck class. Of the two races left to win, Turner believes Voss has a better chance in winning the Henderson. “It is a better opportunity because at Parker the guys are running hard and vehicles fall by the wayside like flies. There is no pitting. You start the race and it is a drag race ‘til you drop,” he said. Racer Max Handberg of Solvang won first in class too. He won the 2000 class. He did it basically with his family. He has a crew of eight, not 40-50 like the more expensive classes. He has no helicopter or expensive sponsors. He funds the race himself and does most of the prep work himself, too. He finished 42nd overall but first in a class of four. The class is a restrictive class. His vehicle has a Volkswagon 1,600 motor with 84-horsepower. It takes preparation and driving to win in his class. Handberg rides in the race with his 22-year-old daughter Christine. He said maybe one day soon she will drive in the Vegas to Reno.